I tend to be a wee bit unconventional about things. Does that really surprise you? I’m sorry if it does. I like things the way I like them even if that goes against the norm. Always have. Always will. In my younger days, this tendency may have resulted in me being thought of as difficult, rebellious, hard headed, or strong willed. All of which are just really nice ways of saying huge pain in the behind. As an adult, the unconventional label means the exact same thing. But as an adult, I get to have a pretty big say about what is considered acceptable in my world. This substantially cuts down on the number of “my house, my rules” arguments since it is, in fact, my house. So what’s the point of fessing up that my head is harder than a cement block? Because that’s the context in which to understand holiday dinners at my house. Once I got to play the “my house, my rules” card, holiday dinners became much more enjoyable. See, I’ve got a secret. I don’t like some holiday staples. Like roast turkey. The best things about the turkey are the crispy skin and the stuffing. But there’s not enough skin to make a meal of and I’ve never mastered the art of stuffing (or dressing, since putting it inside the bird and making it actual stuffing is frowned upon). Yes, my house is a Turkey Free Zone on Thanksgiving. While others are stressed out over trussing and basting and dressing but not stuffing, I’m relaxed because all my ham has to do is reheat, or not, and it’s ready to serve. What’s another benefit of being a TFZ? I don’t have to get up at the crack of dawn to prep a bird for the oven so I get to enjoy a few extra hours of sleep on a day off. And maybe my favorite perk of being TFZ is that my lack of allegiance to the main dish spills over to the side dishes. One year I may serve chipotle mashed sweet potatoes and green bean casserole. The next year, they might be nowhere to be seen. It’s not that we don’t like them it’s just that there are too many good dishes to lock myself into any. I don’t like a set menu anymore than I like roasting up a Butter Ball. So while there’s always a chair at the table for guests, and if you’re in the neighborhood I do hope you’ll stop by, please check your expectations at the door. Or at least satisfy the turkey and cranberry sauce cravings before you come over. And if it’s possible, can you sneak me in some dressing? Nobody besides us has to know and that’s the one traditional Thanksgiving dish that I really miss. BAH Note: I pulled this off my UnTurkey Day menu at the last minute. My cooking collaborator requested the chipolte mashed sweet potatoes. Since she was bringing the good stuff (pie, deviled eggs, and green bean casserole) I did not want to jeopardize their presence at the table. This recipe appeared in the Summer chapter of The Boathouse cookbook. Don’t let that keep you from making this anytime the mood strikes you. It’s slightly sweet and very buttery, which knows no season. The book said this serves 6 to 8 people. I can not confirm that detail since The Mistah and I gobbled all of this down by ourselves. Cover the carrots and onion with water in a medium sauce pan. Bring to a boil then reduce the heat to simmer and cook for 20 minutes or until the carrots are very tender. Drain and transfer the carrots and onion to a food processor. Add the butter and puree until smooth. Taste for seasoning and add salt to taste. Hey! Another person who hates turkey! Long live the TFZ! Kitch, glad to meet another member of the TGZ Club. Maybe we can make up some tshirts and recruit new members? I’m with you Wendi – I like the sides! Though I also think the holidays are complete without cranberry sauce, eaten all by itself. Jen, I could substitute stuffing for cranberry sauce in that last sentence and be utterly content. But Jen, I could be completely happy with just a big bowl of stuffing. When I first saw carrot puree I was thinking baby food, which is what I think when I see or taste pureed winter squash. But then I saw the onion thrown in there and now I’m thinking maybe I should actually try this! Funny you should make the analogy to baby food. Because, in full disclosure, the texture is rather baby foodish. Which is why my cooking collaborator nixed it from Thanksgiving. But the onion and butter definitely make this an adult dish. my roommate would love this, she looooves puree. for someone who doesn’t mind chunky soups or thinner soups, the puree consistency does not sit well with me. i also have a hate relationship with carrots, having been forced to drink carrot juice as a child to improve my eyesight, but with the addition of onions & butter and possibly cream or milk to thin out, i could rock this soup. You know Lan, Carrot Puree is only a step or two away from being soup. I say rock it out. My best friend and I went through a baby food phase in 6th grade. We would go to Peoples Drug and buy jars of the stuff. Dutch apple dessert was the bomb. I think I would really enjoy this carrot puree. Hello Ali and welcome to the BAH confessional. 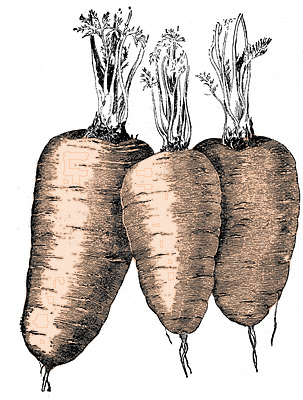 I think you’re a perfect candidate to enjoy Carrot Puree. PS – Peoples Drug, good lord that’s a blast from the past. You keep posting these winning recipes . . . how am I going to have time to make them all???? This will go second, after the mac and cheese.